In addition to being the home of one of Extremadura's most prized treasures, Guadalupe can boast of a cultural and gastronomic heritage that is not to be missed. The foundation of this small town is closely linked to the statue of the Virgin of Guadalupe who, it is said, was sculpted by Saint Luke the Evangelist and buried along with him in Asia. It is said to have been the source of several miracles, such as saving Rome from the plague, or saving the lives of those who undertook the expedition that saw it brought by sea to Seville when given as a gift to the archbishop by Pope Gregory the Great. However, its discovery by a shepherd from Cáceres is what gave rise to a chapel being built here, around which the town's first inhabitants settled. In 1340, Alfonso XI granted these lands to its people and the area pertained to Talavera de la Reina. Some years later the place became known as Puebla de Santa María de Guadalupe. The king bestowed the title of Squire of Puebla on the chapel's prior sometime around 1348, an estate status it maintained until the creation of the founding Town Council in 1820. Today, Guadalupe lives off being a place of religious interest. However it is much more than this, given that the place offers a lot more to see and enjoy, both in the town itself, as well as in its surroundings, lying as it does in the beautiful Sierra de las Villuercas mountain range. You can start your visit at the most important monument, the Royal Monastery of Nuestra Señora de Guadalupe, which has been declared a World Heritage Site. Built in 1340 by Alfonso XI of Castile, the monastery has borne witness to decisive events in Spanish history, such as the audience in which the Catholic Monarchs offered Columbus the ships for his voyage. The building shows traces of Mudejar, Gothic, Renaissance and Baroque influences, while at the same time serving as home to works of great value. Don't miss the Church of Nuestra Señora ( 14th century) and its extremely beautiful altarpiece, the Camarín de la Virgen a small chapel behind the main alter dedicated to the Virgin ( 17th century), the Mudejar Cloister, with its pavilion, the Chapter Room ( 15th century), the Sacristy, the Chapel of San Jerónimo, with its Zurbarán paintings, the courtyard and the Hospedería dining room designed by Rafael Moneo (1994). Apart from these monuments, you should not miss out on a visit to the two painting and sculpture museums, which contain works by Goya, El Greco, Pedro de Mena and Juan de Flandes. 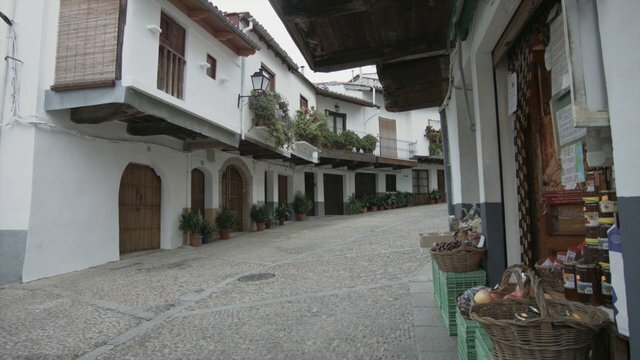 A stroll around the narrow streets of Guadalupe, the town centre of which dates from the 14th to the 16th centuries, serves as a perfect introduction to traditional, rural architecture with its porticoes and balconies. Among some of the town's most enchanting spots are Plaza de Santa María de Guadalupe, the Colegio de Infantes or Colegio de Gramática ( 16th century), now the luxury, state-run hotel or Parador Nacional de Turismo, and the group of buildings known as the Hospitales. Some of these now form part of the monastery's outbuildings or, as is the case with the Hospital de San Juan Bautista, part of the aforementioned state-run, Parador Nacional. Also worthy of mention are the Baroque Church of the Holy Trinity, as well as the five Medieval arches spread over the town's two walls. Other places that are a must-see are the Tres Chorros square with its 15th-century fountain and the Antigua Judería (old Jewish quarter). A walk along the Calle Sevilla will give you the chance to buy both typical and modern items. There you'll find traditional lace and baskets full of local produce such as black pudding and the emblematic "roscas de muédago", a cake for those of a sweet tooth. If you feel like walking a bit more, the surrounding valleys are dotted with very pleasant surprises such as the Granja de Mirabel Palace, the Granja de Valdefuentes palace, the Arca del Aqua a Medieval water collection and distribution system that feeds the monastery and town with drinking water, and the Ermita del Humilladero chapel, all of which have been declared Cultural Heritage Sites. Nature lovers and devotees of trekking should not miss out on the Mill Route or visiting Villuercas-Íbores-Jara Geopark, a veritable feast of nature that provides impressive views and contains a wide selection of plants and flowers. Stretching out from the banks of the Ibor or Guadalupe river to the tops of the mountains, this park abounds in magnificent spots.